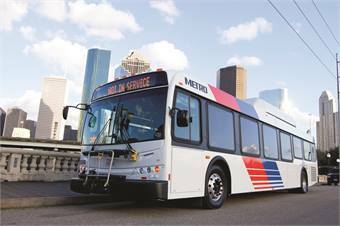 The Metropolitan Transit Authority of Harris County (Metro) opened for business in 1979, and on behalf of Houston, is hosting APTA’s 2014 EXPO. In 2001, Metro adopted a Regional Transit Plan that was enacted in 2003 and called for 30 miles of light rail transit, including the 5.3-mile North Line, which opened in 2013. Currently, Metro is set to open two more light rail lines — Southeast and East End — this year and is in the process of revamping its bus system. METRO spoke with Metro’s President/CEO Thomas C. Lambert about his journey from police officer to head of a public transportation system as well as the success the agency has experienced over the last several years and EXPO. METRO: You have an interesting background; talk about what attracted you to public transportation? Tom Lambert: I am born and raised in Houston, but worked in the Austin area for several years at the Austin Police Department as a police officer. [After a while], I decided it was time to go back and finish my degree. I had gone to school part time for so many years and really wasn’t getting there. I resigned, went to school full time and got my degree. I came back to Houston to interview for some risk management jobs and I was in between interviews, so I stopped to get a cup of coffee at a Foley’s. The place was jam-packed. There was a bus operator by the name of Willie Mitchell sitting at a table by himself. I asked if I could join him and we began a conversation. At that time, Metro was a brand new agency. It had just been formed in January of 1979. Willie said ‘it’s a new organization. It’s dynamic. They are about to start a whole police program that was going to be the first of its kind in the state of Texas.’ That fascinated me. So, I followed up, completed an application, got an interview and was given an opportunity to come on board in 1979 as a security investigator. I began to work with others to not only look at how we looked at proprietary security, but at the same time began developing a police program for Metro. That is what really got me here. It was an opportunity to work with some other committed and talented people to develop a police program from the ground level. Since taking over the top spot at Metro, where have you focused your priorities? In partnership with the board and staff working together, it is a back-to-basics [approach]. It is making sure that we run a very good quality day-to-day transit service for the 370,000 people a day that utilize our services. The first thing we need to do is make sure we take care of our core business and our core customers. The second, was making sure that we brought three new rail lines into completion of construction and into operation. In December of 2013, we opened the North Line extension from our Main Street Line. That’s been a great addition to rail services in our community. We projected about 2,600 riders by the end of September 2014. We are currently seeing about 4,700 riders a day. We are very pleased with the public’s acceptance and utilization of that service. The third priority is we still have two remaining lines to open, the East End Line and the Southeast Line, in the next fiscal year, so we need to make sure that we do that in a quality fashion. The last priority we have is something that I think is going to be transformational to the agency and to the community — a total reworking of the bus network, which will always be the backbone of our agency. 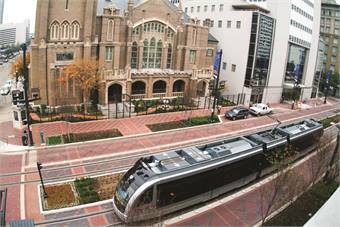 Metro has three light rail lines under its belt, with two more set to launch in 2014. Discuss the importance of the three rail lines to Metro riders and your system. The Main Street Line opened in 2004. It was seven and a half miles and went from the University of Houston - Downtown through our downtown, which is the largest employment activity center in our region. It also goes through the Texas Medical Center, which is the second largest employment center, as well as the museum district, a significant park area and NRG Stadium to the south. It has generated very good ridership since it launched. At the same time, although it’s not directly related to rail, since 2004, there has been over $9 billion of private and public investment a quarter mile off of this rail line. You are seeing more and more residential and commercial development, and more and people infilling, if you will, along that rail corridor. We think that travel choice is encouraging more people to move into the core of the city where they can walk to work or use transit to get to work and all the quality benefits that come from that. That was the importance of the Main Street Line. Again, it was a line that was built with local dollars, because prior to that we did not have any rail up and running. It was designed to see if people would use it and people definitely have. The North Line extension, which is about 5.3 miles, goes from the University of Houston - Downtown out to the North Line transit center. It serves [residential areas], parks and community locations along that line to get people to work. As I mentioned, we are seeing very good ridership there and the quality of service improve. When [the line] replaced bus routes that were serving that area, we gave the customer more hours of service and more frequent service. We gave them more opportunities to connect to get to more locations. They are seeing that benefit, and I think the ridership growth is representing that they appreciate that. The next line that will come on is the East End Line, which runs along Harrisburg Boulevard — a major boulevard in our area. The line serves the East End side of our region and gets people to different jobs and residential areas, as well as an area that is very reliant on improved transit. We think it will bring a benefit. The Southeast Corridor, which is the third line, again serves major residential areas, but it also serves the Texas Southern University, as well as the University of Houston main campus, which is 45,000 students now and growing. So, it really connects a lot of universities and residential areas, as well as job opportunities in the area. You mentioned universities quite a bit. How are you targeting your services to that market? We are doing a lot of things. One, our ridership development group is working with the University of Houston to see how we can get Q cards, which are our smart cards, in the hands of students. So, as they are registering for schools, our staff are out trying to get them to sign up for Q cards and working with the universities where they will communicate that opportunity to them. Also, we have worked with marketing classes at the University of Houston and Rice University, another university on the rail corridor, to get feedback from the students of what we could be doing better to get students to use our services and what could we be doing better to get more people riding our system. You will see us move more into the app field. With mobile applications, you can go on and apply to our trip app, and it will tell you when the next bus will arrive. We have GPS technology on all of our buses, which we are linking to so customers can pre-plan their trip and see the real-time arrival of their next bus — within three minutes is where we are at today. We are continuing to look at making it easier so people can pre-plan their trips. We also have a 360 application. Before you ever ride a Metro bus, train, lift vehicle, or ever use one of our HOV hot lanes, you can go to our 360 app and it will show you how to pay your fare, how to wait at the stop, what amenities are available, basically how to use the system before you ever get on it. We are trying to make it as easy as we can, in the mobile age, to get as much information out to people on their smart phones and their computers. We are working with the University of Houston - Downtown to do an interactive map, where people can go on their computer and, again, plan their trip, see how they can connect and all those things. We are also trying to use social media as much as we can, whether it’s Twitter, Facebook, everything we can to get the word out. Metro is currently revamping its bus network to provide more service and more options for job opportunities. How will the bus system be revamped? The staff, working with a consulting group, took a blank sheet of paper and said ‘If you were going to invest your operating dollars that we spend today in bus service and wanted to generate more ridership, and 80% of your funds were going to go to increasing ridership, and 20% of your operating funds were to make sure you were going to have coverage for those individuals that needed transit, but maybe did not warrant growing ridership, what would that network look like?’ And, ‘what would it look like if it was a high-frequency, seven-day-a-week network, not just the five-day-a-week high-frequency network we have today.’ That’s what we are rolling out. In September, we expect the board to formally adopt the draft network that we will then implement by June of 2015. It is about how do you get people to more employment opportunities, how do you get people to more educational opportunities and how do you get people more opportunities to go where they need to go in a more frequent, high quality service? That is what we are trying to do with the whole revamp of the network. Then, how does that begin to connect to the rail lines we’re building? It won’t all be connected by June 2015, but it will be ongoing. This really is a draft five-year plan. We are going to implement in 2015 and continue to build on it over the next five years. Talk about Metro’s experience playing host to the APTA EXPO. We are excited and looking forward to it. Again, I’m going to tell you my bias upfront, because I was born and raised in Houston, so I’ve always got to put that on the table. Houston is a great place to come to. 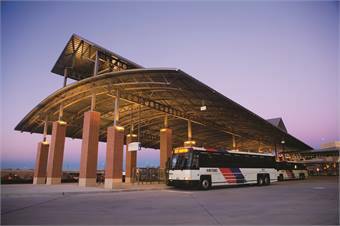 Houston is a great place to see the value that transit brings to a growing community. We are seeing 100,000 people moving into our region every year now. We are very blessed with a robust economy and growth. Metro is very proud to be a partner for all the transportation agencies to work with to do everything we can do to give people travel choices in this region. We think we can showcase that partnership as well, and we’re excited about doing that. We are also proud to showcase Houston TranStar, a partnership between the City of Houston, Harris County, which is our principal county, the Texas Department of Transportation and Houston Metro, that jointly operate a regional transportation and emergency management center that not only works together to manage traffic every day but show how we manage emergencies in the region, whether it’s a hurricane evacuation or a major event. We are proud to say that we are doing things that help people travel around this community, to get to all the great restaurants and great theaters we have in this town. Houston has the second largest theater district in the country behind New York City. We want to be able to showcase that as well as the great museums and great venues where people can visit and enjoy the hospitality that people in Houston are going to show them. How is METRO involved in the planning process? I would always say that I’m going to give great credit to the person that’s doing all the work. Her name is Gwen Johnson. Gwen is the staff lead that is our liaison with APTA. The APTA staff has been great to work with. Gwen has been very much involved in working with APTA to coordinate the tours, to make sure that we’re ready for supporting registration, to make sure our shuttle operations are ready to get people where they need to go, to make sure people understand how to use the rail system, and to make sure they are aware of all the great restaurants and venues we have in the city, because we also get an opportunity to showcase our community, and quite frankly, our system. We also are engaging all of our board members. They will be attending sessions welcoming our chairman. The board will welcome everybody along with the Mayor of Houston and a Harris County judge. We look forward to letting our elected officials welcome everybody with a warm reception, as well.